Summer: N + meltemi (NE). Apart from on rare occasions the S winds do not blow during this season. During June the winds are weak (there will blow a gentle northerly wind, which turns SW and then dies down completely). The meltemi usually starts slowly from sunrise and stops blowing around 1500. If it starts blowing during the evening or blows suddenly etc., then its a sign that the meltmi will be fresh. Autumn: N + S winds. The S start to blow during September (very strong on occasion up to 9Bf). Strong N winds start during October and during November there is usually fine weather. Winter: N + S winds. The S winds are mainly during February when the cold softens which, in turn, fools the almond trees into bloom after which they lose their blossom (characteristic of the area). Spring: N + S winds. These winds blow for the first two months of the season. Actually the S wind during April bring gales.There is fine weather during May with calm winds. Squalls: Occur during July and the wind starts to blow around 1700 - 1800, however not every year. Shelter: From all but the W winds. The W affects all of the harbour but it usually blows during Nov – Dec and Feb. The Mistral (NW) affects only the S commercial harbour. Additionally the strong SW is a serious problem when sailing in or out of the harbour. 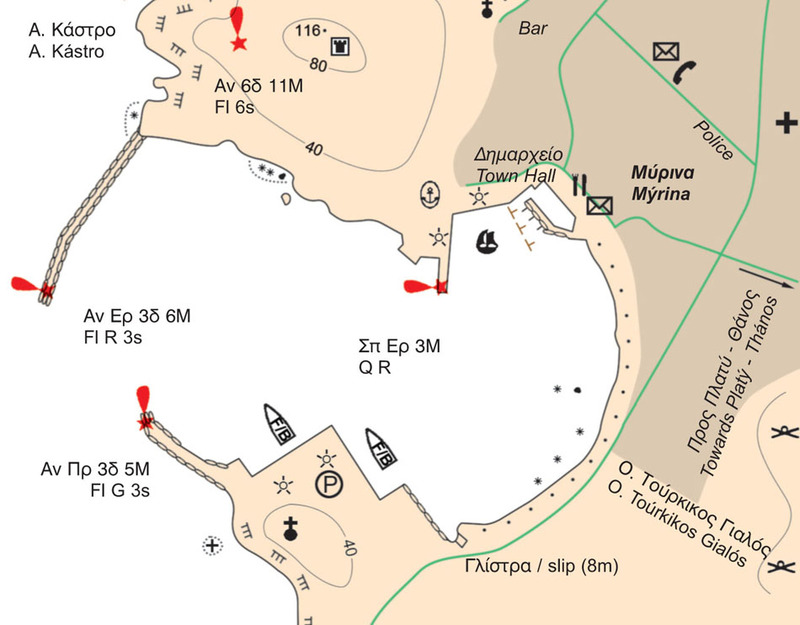 With the NE wind, it is not possible for a boat to stay in the commercial harbour, as the sea gets very rough and there is a swell, but ships are not affected. This wind (NE) should also be taken into careful consideration when mooring alongside the pier of the northern basin, as it propels them against it. In this instance a shackle of chain may assist in restraining the ship.